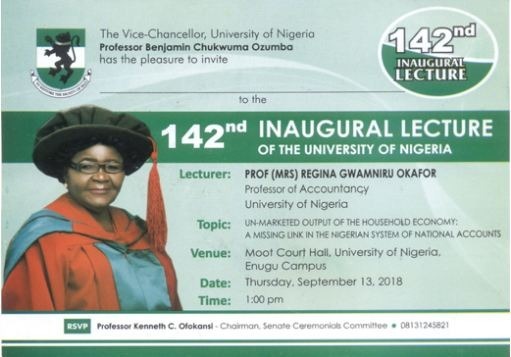 UNN 142nd Inaugural Lecture Invitation By Professor Regina Okafor. The VC of University of Nigeria, Prof. Chukwuma C. Ozumba wishes to invite the entire members of the University Community, as well as the general public to the UNN 142nd Inaugural Lecture. The Inaugural Lecture, titled, “Un-marketed Output Of The Household Economy: A Missing Link In The Nigerian System Of National Accounts” will be delivered by Professor Regina Gwamniru Okafor (A Professor of Accountancy). Date: Thursday, September 13, 2018. 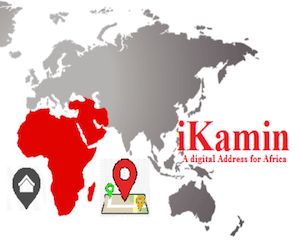 Venue: Moot Court Hall, University of Nigeria, Enugu Campus.